Cybertron is falling! Get to da Arkh!! 2 november, 2012 Säg något! I’m a bit Late To The Party, but I’ve just recently started to play Transformers: Fall of Cybertron. So we’ll see if the game is any good and if it lives up to my expectations, as always there will be spoilers. So if you don’t want to know anything about the game, then you can stop reading now. There are a lot of stuff in this game that hints to the old cartoon series and the movie, I love all of the stuff. Like Grimlock and Slug’s lite quarrel over Beryllium balogna and Cesium salami. Laughed good at that and it’s those little things that flirt with the older G1 fans that I love so damn much. And there is a ton of stuff like that in the game, hope you can find them. The gameplay feels much better and I enjoyed playing this game much more than I enjoyed the first game. Two of my favorite parts of the game is the first time you play as Megatron. You almost feel like you could take on a whole world and conquer it. And the other thing is when you finally get control of Grimlock. Oh, the beautiful, beautiful destruction. Too bad you don’t get to play as the other Dinobots. 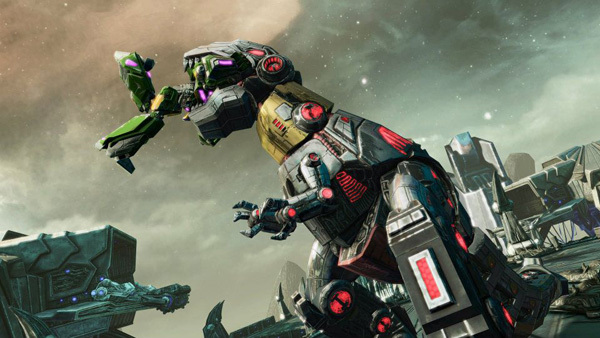 And Greg Berger reprising his role as Grimlock is awesome as hell, he really does the character justice. A shame Corey Burton didn’t reprise his role as Shockwave, he is still the best voice actor for him. Even if I really enjoyed Steven Blum in the roll, but it’s the Christoffer Lee like voice from Mr.Burton that really adds to the character. So if you get a chance to give this game a twirl, “Me Yazuka say, you should try and play!” I don’t want to spoil anymore of the game, so if you like Transformers I really recommend you try this game. And hopefully you’ll like it too.